REEDER'S PROPHECY XXIX- WHAT'S NEXT? I have been thinking about my relationship with Mystery Man. I am a strong person, but sometimes it hits me... I MISS HIM. Yikes!!! He showers me with gifts... tons of shoes. As a person, he makes me laugh all the time. A very good looking and charming man. The only problem is that he has so many issues to deal with... being OPEN about his sexuality. The last time he was here, he told me that he loves me. I was stunned. I replied, "I love the shoes you gave me." I am hoping for the best. I need to make a decision. Last night, Girard and I were craving for sushi. He has been a good friend of mine for the longest time. His sister, Ginger, is one of my dearest friends. 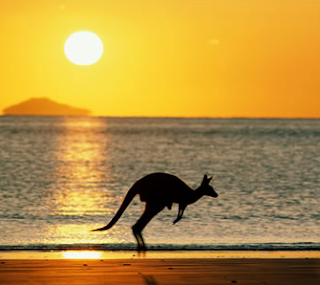 We always love to go to the same place. 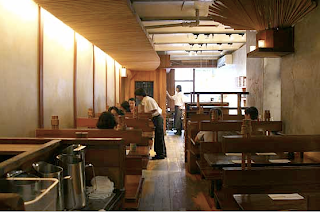 I always think of the N word for Japanese restaurant... Nobu Next Door. He told me that he wanted to go to another place. 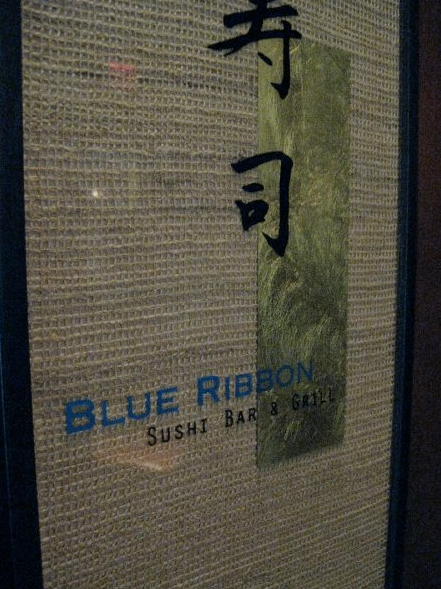 I suggested BLUE RIBBON SUSHI. I told him that I know the place and it is right beside Mezzogiorno. We waited for our table. As soon as I looked at the menu, the food is a mix of French and Spanish. I asked the waiter if they have another menu for Japanese. He smiled at me and said, "Blue Ribbbon Sushi is a block down. You are in Blue Ribbon Brasserie." I felt ashamed. Can you imagine? I have been living in New York for 10 years and I do not look at the address. I apologized to Gerry and I told him that I'd come back next time. He gave me a cute smile... OOPS!!! Finally, we arrived at the right BLUE RIBBON restaurant. This time, we did not have to wait. I was smiling the whole night. A couple of weeks ago, I styled a photo shoot for my client. It was a last minute thing. I only had a day and half to prep for the shoot. Luckily, she is sample size. Here is a picture of her with her dogs in a stunning Marchesa dress, Christian Louboutin shoes, and H. Stern jewels. I am glad that I have Michael and Kendra to help me. They are the best. PS: This is the week that I did not have time for MYSTERY MAN. Last night, I had a meeting with my friend Trixie Villanueva at Minetta Tavern. I always love going there because of the food. I was craving for good fish. After 3 glasses of Sauvignon Blanc, there was no more room for the chocolate souffle. Guess who was at the door? Sting and his wife Trudie. I love the Police and him as an individual singer. I do not know how old he is, but he is aging well. At the end of the night, it was good meal. What a treat? 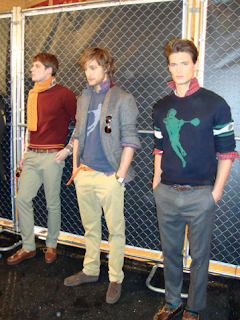 Last week, I went to the Lacoste showroom to look at the collection for Fall/Winter 2010. 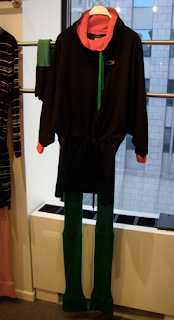 Christophe Lemaire is the genius behind the brand. This season, he was inspired by the heritage of the house. 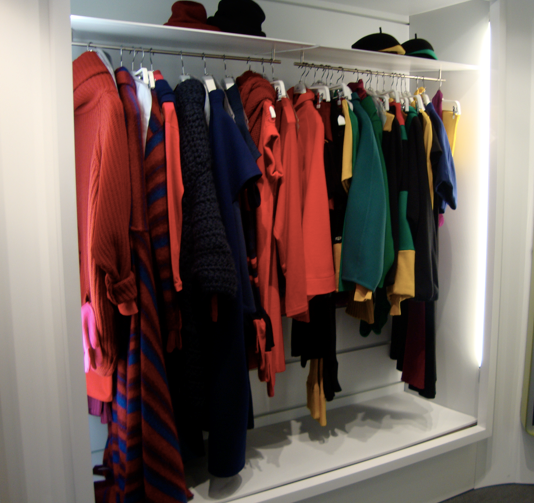 Splashes of bright colors were displayed on the racks. If you were to ask me, I think it is the modern day "Ski Patrol"... American movie in the 80s. Two weeks ago, mystery man was in town. He was in New York for a week. I only had a chance to spend a day and half with him. He told me that his project is complete. He will be gone for more than 3 months. I told him to BEHAVE. As tough as I can be, it is difficult for me to think that I am in this type of relationship... God knows. Sometimes I feel like I am one of the characters from the movie, "Gone with the Wind"... Scarlett O'Hara. Hahahaha. He is very happy for what I have been doing. I told him that my dream is for him to be FREE. Nothing is impossible, but I am hoping for the best. Who knows? The two of us might continue this relationship. Time will tell. This afternoon, I got a package from San Francisco. What else? 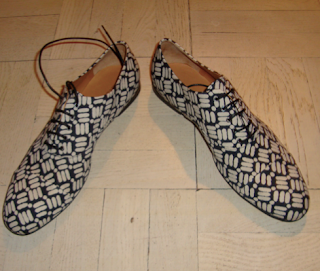 My shoes from Dries Van Noten. 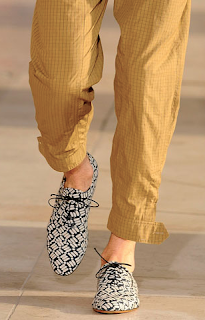 I have been tracking down these runway shoes from his Spring 2010 collection. I had to ask my friends to search this particular style in Paris and London. Thank God for Gimme Shoes in San Francisco. Now, I can stride on the streets of Manhattan wearing these amazing pair. 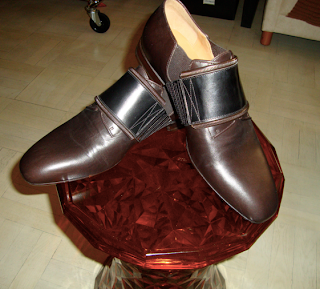 After blogging about my shoe obsession, it is time for me to give credit to a good friend of mine... Bryan Boy. I have known Bryan for a couple of years now. He knows the story behind our frienship... Xyz. As I was flipping through the March issue of Vogue, I came across his photo and a group of fashion bloggers. Vogue is the leading magazine in the entire fashion universe. I commend them for giving credit to the new age of fashion... blogging. Our motherland is proud of him. Once again, triumph for the Filipino race. Congratulations to you. I am such a shoe addict. I just love shoes. 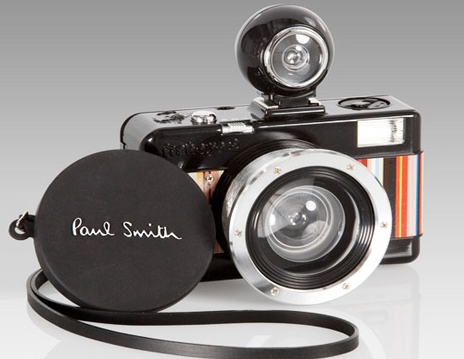 I cannot blame for having a knack for beautiful things. 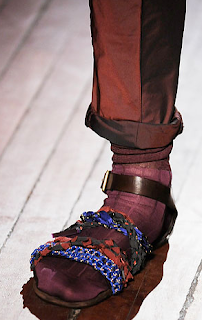 I love, love, love Dries Van Noten. My good friend, Ginger Ignacio, sent me a thank you present from Browns of London. What else? 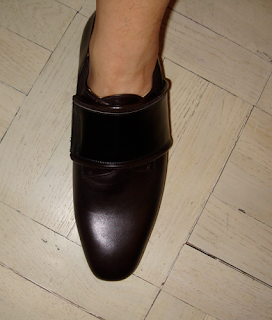 Shoes from my favorite designer. The weather is gorgeous in New York. I am loving every minute of it. Time to get out of my apartment. OUT OF LEATHER SPA REHAB!!! I just love statement shoes. Well! My sandals just came out from shoe rehab... Leather Spa. 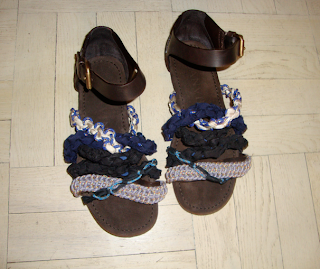 I asked David (the owner of Leather Spa) to put stoppers for my amazing sandals. Friendship bracelets can be fun... in LANVIN STYLE. When it comes to shoes, I want statement pieces. 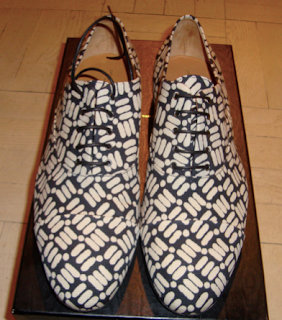 For Spring 2010, Dries Van Noten made the perfect lace up shoes for men... amazing print. 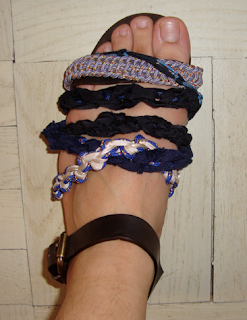 Lanvin revived the friendship bracelet sandals. 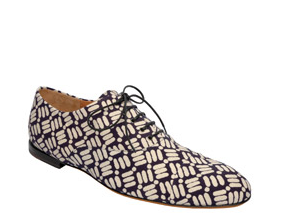 I am proud to say that I am getting these shoes soon. The Dries is being shipped from San Francisco (www.gimmeshoes.com) and the Lanvin is in leather spa rehab. My mother asks me this question, "What are you going to do with all of your shoes?" I always reply to her, "Wear all of them." I respond to color and I treat each of my shoes as a piece of art. PS: The Dries Shoes was so hard to find. I even asked my niece, Betina, to check all the stores in Paris. I was feeling a little sad last night. Why? Mystery man is leaving again. What makes me happy? Being with him and doing nothing. He knows I like watching movies from the 50s and the 60s. 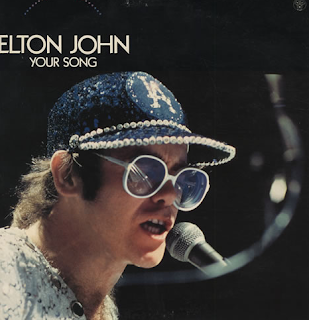 Every time I leave his apartment, he always sings to me Elton John's "This is your song". It is so adorable how he sings it. Of course, I was being dramatic and I cry in every song. Well! I do not know where this relationship is going. "It's a little bit funny this feeling inside... I hope you don't, I hope you don't mind that I put down in words... How wonderful life while you're in the world. I gotta go and get back to work. PS: He sings this whole song to me. I have been working like a dog for the past months. It is good for me. I know this year is my year. Right now, I am in Tribeca. I have not seen him in the longest time. Mystery man looks good. He had a hair cut. His body is leaner. Last night, I was suppose to go to his place and sleep. My overnight bag was at his place since Friday. He was teasing me that I am the most organized person in the world. Well! I got a present from him. 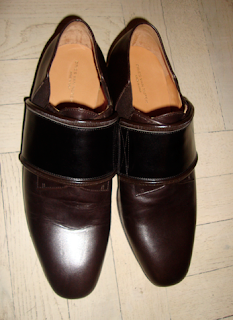 He got me Dries Van Noten shoes from London. He knows I love shoes. I will have to take a picture of it when I get home. NOT THE EXACT SHOES, BUT I WAS HOPING. These girls deserve a medal of honor for gracing the red carpet in STYLE. They know what they want. Their stylists did an amazing job. Cheers to you girls for making the OSCARS not too boring. My favorite Versace dress made it to the Elton John dinner during the Oscar night. T.M. gave the dress life. She wanted pink. I gave her a modern dress in her color choice. Of course, her dress paired with H. Stern jewelry and Jimmy Choo gladiator sandals. Next stop, her photo shoot this Thursday. My client attended a fete last night. 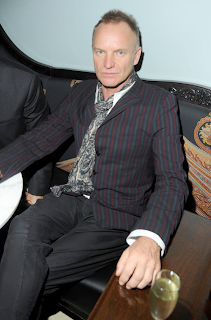 Montblanc and The Weinstein Company sponsored the pre Oscars party in behalf of Unicef. The event was held at the SOHO House in West Hollywood, CA. She wore an amazing blue silk satin tulip cocktail dress by Marchesa. In the jewelry department, she was decked out in all H.Stern (ring, cuff, and earrings)... thanks to Lisa of H. Stern and the girls from CohenRaines PR (Samantha and Jennifer). To complete the whole look, she paired it up with metallic copper platform shoes from Brian Atwood. She and I have a good relationship. She knows that I have a good eye and I like to edit things. I love to do all the research and mix up everything. I just do not follow the trends. I know she will be big someday and I am honored to a part of her team. My client is in Tinseltown already to attend her first Oscar parties. To start the ball rolling, she went to the OK Magazine pre Oscars party last night. She wore an amazing cocktail dress from Angel Sanchez's Fall 2010 collection. The saffron color complemented her blonde hair. For jewelry, she wore pieces from Bo Chic. My go to girl Alicia Pantano knows what type of pieces I like. Well! She delivered the goods through the help of Allison Katz from Krupp Group. Good Job! She paired her whole ensemble with red d'orsay pumps from Christian Louboutin. Of course! Her clutch is from Samantha Thavasa in leopard peony skin. Amazing. I am sick right now, but I am happy. 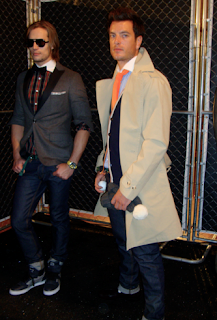 Last February, New York celebrated Fall/Winter 2010 known as FASHION WEEK. 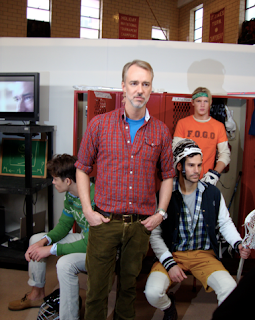 In the beginning, I was hesitant to go downtown and look at the collection of Michael Bastian for GANT. Well! He delivered a strong collection for his menswear line for the prestigious fashion house. 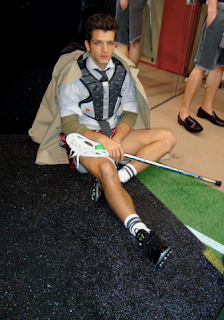 He was inspired by LACROSSE. True enough, the setting of the presentation was done in a gym and the stage was the locker room... eye candy. It was a celebration of color for his first debut collection. 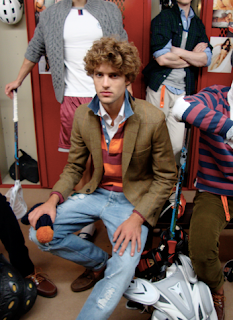 Embroidered Lacrosse player on the left chest of sweaters and t-shirts. It was a well edited collection. The treat...MEN all lined-up that came down marching from Mount Olympus.